In this part we will explore the meaning of the 58th Shloka of Sri Vishnu Sahasranamam. 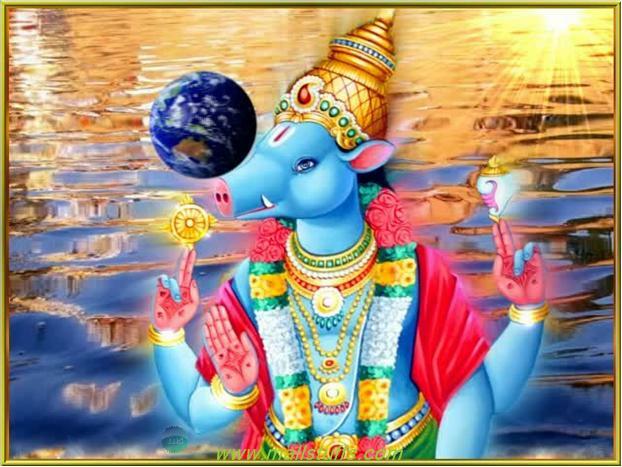 Bhagavan incarnated as MahaVaraaha, the great boar, and rescued the Earth. He is known through words or utterances though He is not fully describable through words. 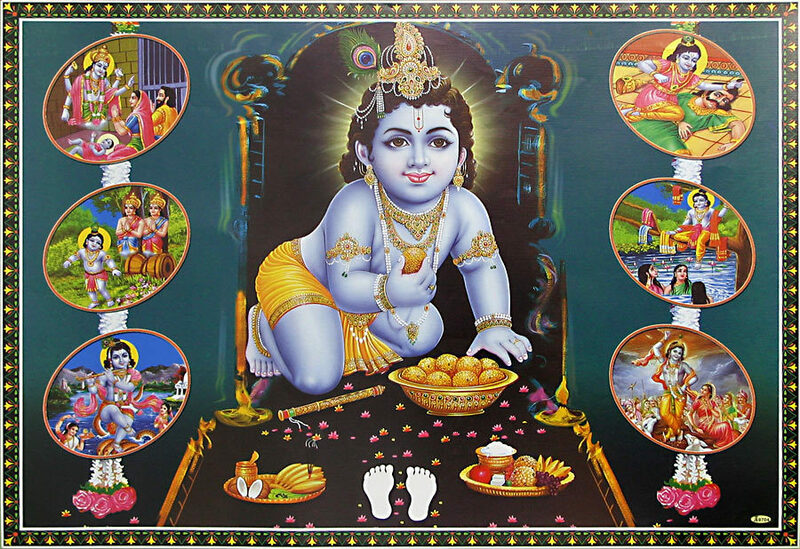 He is Govindah, the protector of the world. He has a distinguished army at His command supported by Ganas with Vishvaksena acting as His army chief. He is adorned with golden armlets and other ornaments radiating His brilliance. He is hidden inside our heart and can be realised only through knowledge and contemplation. Bhagavan is deep and is not easily understandable; His majesty can only be approximately indicated. He is deep, incomprehensible who cannot be gauged with words or mind and is hidden. He carries the Discus and the Mace for the protection of the world as Chakra-Gadha-dhari. Sri Adi Sankara explains this as ‘Mahaan cha asau Varaahash cha MahaVaraahah – He incarnated as the great boar and hence He is called MahaVaraahah’. This Nama refers to Bhagavan’s Avataar as the great Boar, the AdiVaraaha. When Hiranyaaksha was about to sink the earth under the depths of Primordial Ocean, Bhagavan emerged as a mammoth Boar and rescued the Earth with His tusk and hence He is known as ‘MahaVaraah, the gigantic Boar’. 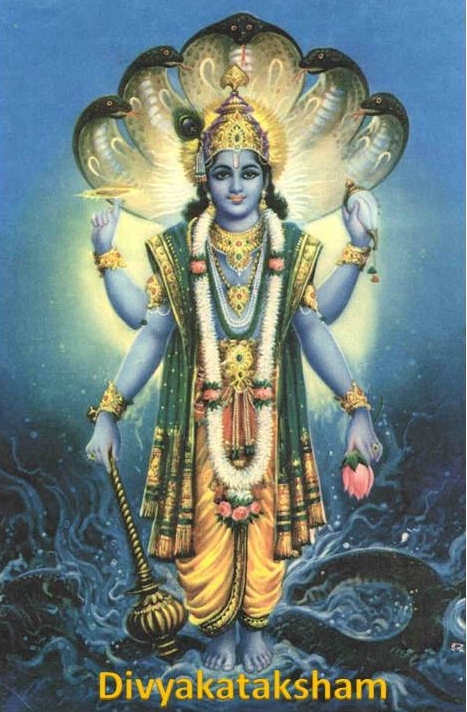 Meaning: The Great Varaaha Bhagavan, Who has eyes like full-blown Lotus and the complexion like that of blue lotus-petal, lifted the Earth from the Rasaatala (nether-world) by His tusk and emerged as a great blue mountain”. 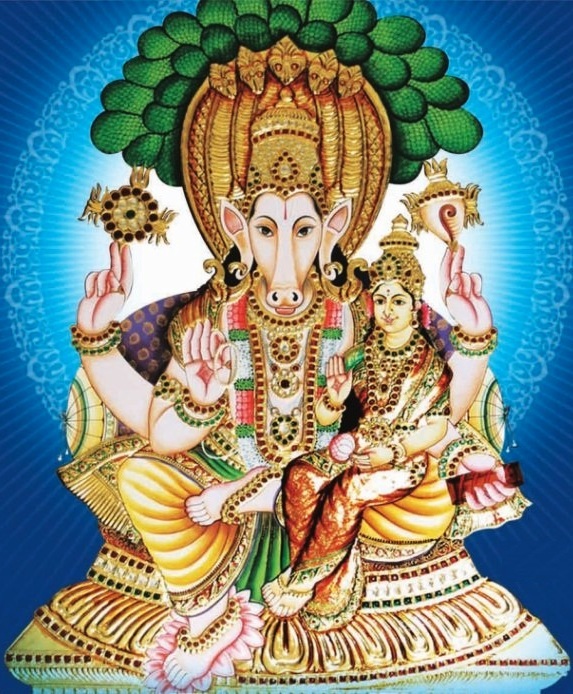 Meaning: The Lord Varaaha (the big Boar) who came to rescue the Earth from the depths of the Ocean, cast His Divya Kataksham with His big beautiful Lotus eyes on us. Aren’t we fortunate to receive His Kataksham (கடைக்கண் பார்வை), now can bad times afflict us in this Samsara? Please tell. Swami ChinmayAnanda comments that the Varaaha Rupa was taken to heave up the world from the slush that formed naturally when the waters of the deluge receded. Sri Satyadevo Vasishta gives the interpretation based on Maha + Vara + Aha which means He who bestows great blessings on others. One who dug out the Earth from the depths of the Ocean. For the current occurrence Sri Adi Sankara gives two additional interpretations. 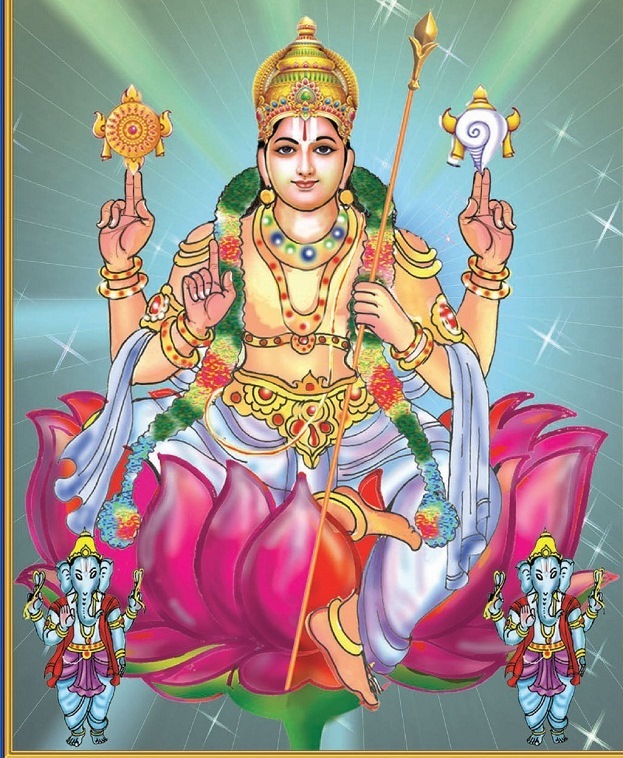 He quotes this passage from Vishnu Tilakam ‘Gobhireva tato Vedyah Govindas Samudaahritah – He is said to be Govindah because He can be learnt through words’. Sankara further says ‘Gobhih Vaaneebhih vindate iti – He is known through words or utterances hence He is Govindah’. There are many written words like Ramayanam, Bhagavatam which describe him and thus reveal Him to us. 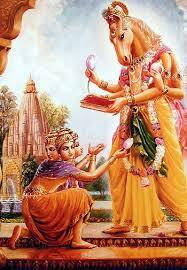 Since He is described by these words He is Govindah. This doesn’t mean that He is fully describable through words but words give the first introduction and thereafter one has to understand Him through contemplation, meditation and devotion. 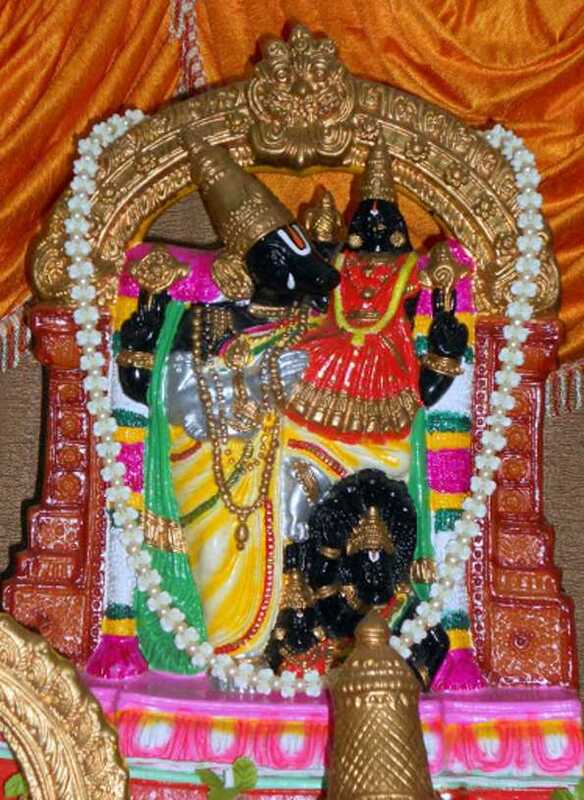 The other explanation is ‘Vedyat iti Vedaanta Vaakyaih iti vaa Govindah – He is fully revealed by the scriptures like Upanishads hence He is Govindah’. His qualities and nature are revealed by many Upanishads such as the MahaNarayana Upanishad. Sri Bhattar gives interpretation under the current Nama viz. Bhagavan is Govindah because He rescued the Earth from the Asura. Sri Satyadevo Vasishta derives his interpretation starting from the root ‘gam – gatau’ meaning ‘to go’ (gacchati iti gauh), and gives the meaning “to possess” to the word ‘Vid’ (vid-laabhe – to get), and thus derives the interpretation that anything that moves, including our mind, our Indriyas, the Sun, etc., are His possession, and so He is called Govindah. He supports his interpretation based on “gacchati iti jagat” – Bhagavan is present everywhere as seen by the movement of everything in this world. The life in all things that live is associated with movement, and He is the One who is behind this movement – Govindah. This all goes to show the richness of the Nama Govindah and how much it is packed with various meanings. Le’s look at the Lord’s Glory (Mahima) as the rescuer of the Vedas in his incarnation as Hayagreeva. Hayagreeva is an incarnation of Vishnu, depicted with a human body and a horse’s head, brilliant white in colour, with white garments, seated on a white lotus. Hayagreeva is an embodiment of intelligence and knowledge. He is a divine being who bestows divine intelligence and wisdom. During Creation, the demons Madhu and Kaithaba stole the Vedas from Brahma, and to retrieve the Vedas Lord Vishnu took the form of Hayagreeva. This story represents the triumph of pure knowledge, guided by the divine over demonic forces of darkness. Once Lord Brahma was becoming tired of his creative activities and was in need of some rest. The night of the Brahma was approaching. Given his fatigue, Lord Brahma yawned. All the four Vedas slipped out from his open mouth. The two demons Madhu and Kaitabha, who were nearby, stole the Vedas from Brahma. Brahma was powerless in creating life anymore without the knowledge of the Vedas. Brahma approached Lord Narayana who took the form of Hayagreeva (A man’s body with a horse’s head) and slayed the demons. 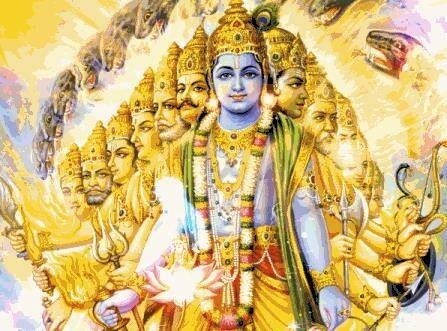 Since Lord Hayagreeva rescued the Vedas, which are the essence of all knowledge, we worship Hayagreeva as the God of Knowledge. Swamy Vedanta Desikan, extols the glory of Lord Hayagreeva and says that He is the one who can change one’s fate (Brahma-Lippi). Lord Hayagreeva’s blessings are sought when beginning any branch of learning. Special worship is conducted on the day of the full moon in August (Sravana-Poornima) and on Mahanavami, the ninth day of the Navaratri festival. Meaning: We meditate upon the Supreme Lord Hayagreeva, who has the neck and face of a horse, Who’s Thirumeni (body) has a hue of blemish-less white crystal, who is adorned in a spotless white Vasthram and Who is radiant. He is the embodiment of Jnana (Divine Knowledge) and Anandha (Bliss) and He is the abode of all Vidhyaas (for all branches of Learning). always reside in my mind and grace me with His nectar-like cool white rays so that I am always immersed in His thoughts and May He forever manifest in my heart! Sri Adi Sankara interprets this as ‘Shobhana sena ganaatmikaa yasya iti Sushenah – He owns an auspicious and distinguished army of dedicated soldiers called Ganas or Parishads’ at His command. The Dhyana Shloka ‘Yasya Dvirada Vaktraadyaah Paarishadyaah Parasshatam Vighnam Nignanti satatam Vishvaksenam tamaashraye’ refers to His Paarishadyaas or army of elephants and soldiers headed by the captain Vishvaksena, the army chief. In various Avataars He got the support of various dedicated and distinguished armies. For example, in the Rama Avataar it was the Vaanara army and in Krishna Avataar He had the Yadava army. Sri V.V. Ramanujan adds that the current Nama and the following few Namas are in the category of what Sage Vishvamitra refers to when he says “Aham Vedmi” etc. to Dasharatha when he persuades Dasharatha to send Rama with him. He reassures Dasharatha that he understands the greatness of young Rama as Rishi. Sushenah is interpreted as ‘Su-Senah’ (One who has a good army) by Sri Parasara Bhattar. He explains that Bhagavan has a body which is pure Shuddha-Sattva. The constituents of this Shuddha Sattva body are an army that can win over the Baddhas, Muktas and Nityas, and make them join Him in mutual enjoyment of Bliss. The constituents of Bhagavan’s body are the Pancha Maha-Shaktis, Parameshthi, Pumaan, Vishvah, Nivrittah, and Sarvah, just as our human body is constituted of the Pancha Bhutas (Air, Fire, Water, Earth and Ether). The Pancha Maha-Shaktis are represented by the Shuddha Sattva Dravyas and can only be realised through the Upanishads, hence they are also referred to as the Pachopanishat. The Panchopanishat Mantras constitute the Sena referred to in this Nama. Sri P. B. AnnangarAcharya Swami explains that Bhagavan has multitudes of means to keep His devotees under His sway. Meaning: O Lord, you came riding on the Garuda and saved Gajendra with your Chakra. Even if you were to bestow knowledge (gnana) to all your devotees, that would not diminish your glory. Meaning: The sweet Lord of Kuttanattu Tiruppuliyur, who stands like a Mountain of gems surrounded by Lotus ponds. His chest, lips, eyes, navel, hands, feet and vestments are Red like the Lotus petal. He is so enchanting that He captivates the mind of His devotees and holds them in His sway. Sri Radhakrishna Sastri elaborates that Bhagavan’s army includes the following: 9 Ganas, 12 Adityas, 10 Vishvadevas, the Ashta Vasus, 26 Tushitas, 64 Abhaasvaras, 49 Maruts, 30 MahaRAaajikas, 12 Saadhyas and 11 Rudras. Sri Satyadevo Vasishta derives the Nama from the root ‘si–bandhane’ meaning ‘to bind’. He gives the interpretation that Bhagavan is the One who binds everything together (His devotees to Him, His army of Devas, Sages, etc.). He holds all the beings of the world together, binds all the constellations together, holds this frail body of ours together even after the Jiva departs from the body, etc. Swami ChinmayAnanda explains Sushenah as One who has a charming army ably supported by His Ganas. Angada is an ornamant worn on the upper arm and Kanaka means gold. Sri Adi Sankara explains this as ‘Kanakamayaangadaani asya iti Kanakaangadee – He has got armlets made of pure gold hence He is called Kanakaangadee’. Bhagavan is ‘Sarva Abharana Bhooshitah’ – adorned with every possible ornament and the Angada is just one of His hall mark ornaments. Sri MahaVishnu is also known as Alankara-priyar, one who loves to be adorned. Sri V.V. Ramanujan explains as ‘AntarAditye hiranmayah purushah drishyate meaning Bhagavan’s appearance is shining like gold. Sri NammAzhwar in his Thiruviruttam (85) calls Bhagavan as, “Maanikkame! en Marakadhame! Matroppaaraiyilla Anip ponne!” in meaning He has extraordinary brilliance and is extremely charming with an enchanting Thirumeni. Thus, the reference in this Nama to Kanaka is to the non-material, Shuddha-Sattva. The ornaments referred to here are not materials of this world but are made of up of the three Gunas – Sattva, Rajas and Tamas, and also composed of celestial matter (Shuddha Sattva). Sri Bhattar points out that this Nama refers to the constant and permanent association of the brilliance of His Thirumeni (Nitya-yoge inih). The reference is not only to the armlet, but to all the Thiru-Abharanas of Bhagavan (like his Kreedam, Vanamala, Koustubam etc.). Sri Satyadevo Vasishta interprets the Nama in terms kanaka, anga, and da, meaning The Giver (dah) of brightness (Kanaka) to everything and the One who keeps things moving (anga from ang – to go). The association or connection between the Kanaka and anga aspects keeps the body moving, it has the brightness in the eyes, and when the brightness ceases, the body ceases to move. Sri Adi Sankara gives two interpretations for this Nama. The first is ‘Rahasya Upanishad Vedyatvaat Guhyah – One who is to be known only by the esoteric and rare knowledge conveyed by the Upanishads’. The second explanation is ‘Guhaayaam Hridayaakaashe nihita iti vaa – He who is hidden in the Guha or the cavity of the heart. Kaivalya Upanishad says ‘Parena naakam nihitam guhaayaam vibhraajate yadyatayo Vishanti – He is seated in the cavity of the heart which is entered only by ascetics’. The import of this is that He is not realised through the ordinary senses or the logic of the intellect or the mind, but He is attained only by deep meditation, contemplation and inward focus together with an understanding of scriptures like the Upanishads. Sri Bhattar points out that He is concealed by the possession of a body which is made up of celestial matter (Shuddha sattva), which is revealed in the great Upanishads. Thus His Divya Atma-Svarupa which cannot be comprehended by us. 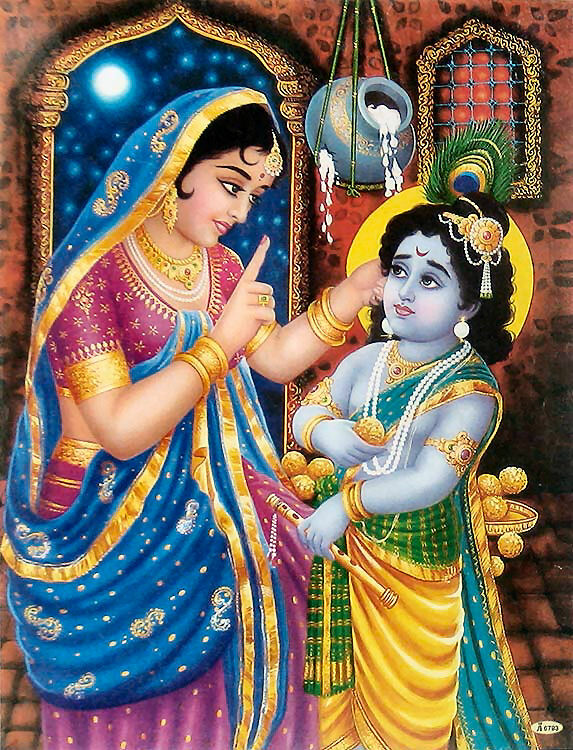 Meaning: He is Lord Krishna, who swallowed everything and recreated the world in his Leela. He churned ambrosia from the ocean and gave it to the Devas. He is Achyuta, Ananta, Govinda, reclining on a serpent couch. My Lord is in all things and all beings, and He is beyond comprehension. Sri Radhakrishna Sastri elaborates on this further and points out that He is not realized through the ordinary senses or the reasoning by the mind, but only by deep inward meditation and contemplation. He cannot be revealed by someone else, but only by our own inward search. Thus, He is Guhya or concealed. 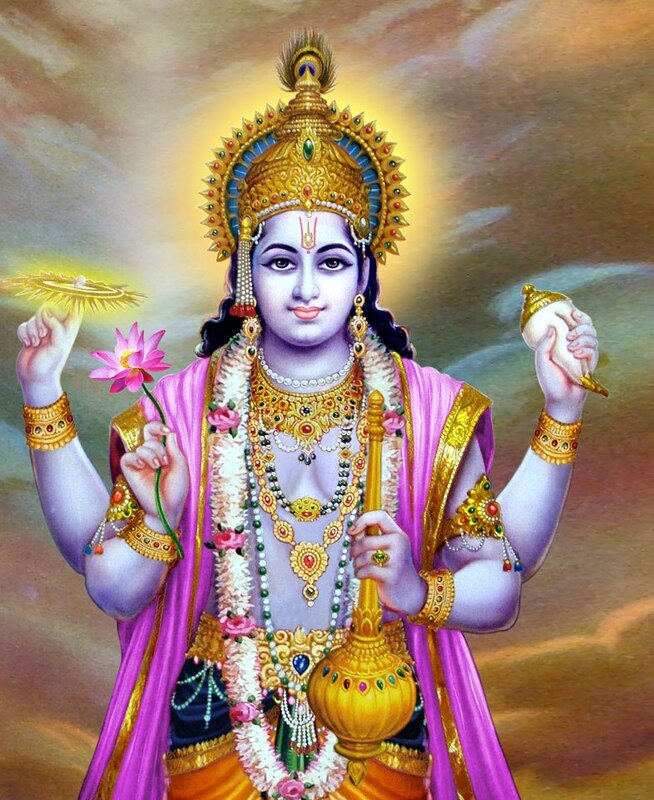 Swami ChinmayAnanda explains that Vishnu is to be realised in the secret chambers of the heart, hence He is called as the Supreme Secret (Guhyah). Sri Adi Sankara interprets this as ‘Jnana Aishvarya Bala Veerya adibhih Gambheerah Gabheerah – He has perfect endowment of Wisdom, Wealth, Strength and Valour which makes him deep, mysterious and unfathomable, hence He is called Gabheerah’. Bhagavan is deep and is not easily understandable; His majesty can only be approximately indicated. If a person caught in the cycle of births and deaths, with his trifle of knowledge can be purified by merely coming into contact with Him, this can give an approximate idea of His greatness. This is like the muddy water which becomes clean by coming into contact with the ketaka seed. Similarly, devotees can become pure and attain Moksha by contemplating on the Lord. Sri Radhakrishna Sastri adds that Bhagavan is mysterious because He has the simultaneous co-existence in perfection of all the six Gunas – Jnana, Bala, Aishvarya, Veerya, Shakti, and Tejas. Just as the bottom of a very deep lake with very clear water looks like it is shallow despite its depth, Bhagavan’s depth is impossible to assess even though for the devotees He makes Himself easily accessible. We covered this Nama earlier as Nama 384 in Shloka 41 and explained it as He is deep and Inscrutable. Sri Adi Sankara gives two explanations for this Nama. The first is ‘Dushpraveshatvaat Gahanah – It is very difficult to reach Him or gain access to Him and He is Impenetrable, hence He is called Gahanah’. The second interpretation is ‘Avasthaatraya bhaava abhaava sakshitvaat Gahanah – He is the witness in all three states, namely Wakeful, Sleep and Dream State and hence He is called Gahanah’. He is inside everyone and everything, and is the witness of everything regardless of its waking, dream and sleep states. Sri Bhattar explains the Nama as ‘Dur-avagaahah’ which conveys a similar meaning of Inestimable or Incomprehensible. Even though it is possible to see the floor of the Ocean when the waves are weak and the water is clear, it is very difficult to assess the bottom of the Ocean floor. Similarly, Bhagavan may seem easy to realize because of what is revealed in the Upanishads, but it is difficult to grasp His Nature and experience Him. The Shruti declares Him as “AprApya manasa saha – Inaccessible to the mind”. Sri Radhakrishna Sastri explains that Gahanam here refers to a forest, a fortress etc. Just like we cannot see or figure out what is in a dense forest or inside a well-guarded fortress, Bhagavan’s Nature is similarly incomprehensible. In his commentary on Amarakosham, AppayArya gives the explanation “Gahanam dushpravesha sthaanam – A place that is difficult to access”. Sri Sastri gives an alternate interpretation for Gahanah based on its derivation from the root ‘Gaahu – vilodane’ meaning ‘to dive into’. Bhagavan is called Gahanah because He is inside everyone and everything, and is the witness of everything in its waking, dream and sleep states. Through these three states we get an understanding of what is within our ability to comprehend. But through these three states, we cannot get an idea of the One who is the Witness of these three states in all of us. Meaning: No one can catch hold of Him either from above, or across, or in the middle. There is no likeness of Him. His name is Great Glory (Mahad Yasah). Meaning: His form is not an object of material or physical vision; no one beholds Him with the physical eyes. Those with pure intellect and the Knowledge of Unity based upon reflection, realize Him as abiding in the heart become immortal. The form of ParaBrahman cannot appear before our material eyes. Nobody can visualize Him physically. Those who experience Him spiritually through meditation become immortal – free from birth and death forever. We need to develop spiritual senses to visualize spiritual reality. Those who are fortunate enough to advance to that level in spiritual life, never take birth in a physical frame of human body. They reside forever in the Vaikuntha or spiritual world with the Lord. Meaning: But you cannot see Me with your present eyes. Therefore I grant you divine sight by which you can behold the Omnipotent Majesty of My Ultimate transcendental power. Lord Krishna through the above Shloka is saying the same thing as expressed in the Svetasvatara Upanishad i.e., He cannot be seen with physical or material senses. Arjuna was given special transcendental or divine senses to visualize Lord Krishna’s transcendental form. Sri Adi Sankara explains this as ‘‘VaangManasaa Agocharatvaat Guptah – He cannot be gauged with words or mind, hence He is called Guptah or the hidden one’. Meaning: This Atman is not visible, though hidden in all beings. Even with all efforts of the mind and senses the Atman does not reveal Himself because He is hidden and does not manifest Himself. This Nama is formed from the root ‘Gup-rakshane meaning ‘to protect, to conceal’. Sri Bhattar explains that Bhagavan’s Greatness is guarded and well protected by the Purva Acharyas who knew His Greatness by His Grace. He is also protected with great care by the AnantAzhvan, Garuda, Vishvaksena, etc. Even in Parama padam where it is not easy for anyone to enter, He is protected by Ananta who is spitting poisonous fire. Swami ChinmayAnanda says that He is well concealed and can only be comprehended by a steady mind that has been purified continuous meditation. Sri Adi Sankara interprets this by quoting a popular verse ‘Manastatvaatmakam chakram Buddhitatvaamikaam Gadhaam Lokarakshaartham Dharayati iti Chakra-Gadha-dharah – He carries the Discus and the Mace for the protection of the world, hence He is called Chakra-Gadha-dharah. Chakra being fast and constantly moving represents the mind. The Gadha being strong and firm represents the intellect. 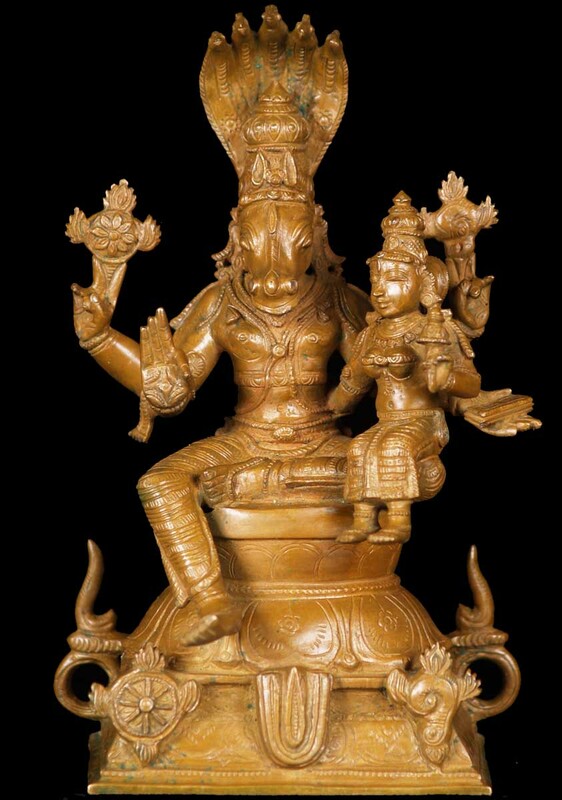 Bhagavan carries them both constantly for the protection of the world. This is also reaffirmed in the last two Shloka of Sri Vishnu SahasraNamam ‘Shankha bhrin Nandakee Chakree Saarnga dhanvaa Gadaadharah’ and ‘Vanamaali Gadhi Sarngi Sankhi Chakri ca Nandaki’. Bhagavan carries His five principal weapons viz. the Conch (Shanka – Panchajanya), the Sword (Khadgam – Nandaki), the Disc (Chakra – Sudharsana), the Bow (Dhanvi – Saarnga) and the Mace (Gadha – Gaumodakim). While the reference in this Nama is only to Chakra and Gadha, Sri M. V. RamanujAcharya explains the significance of this Nama with the Pancha MahAyudhas (Sankha, Chakra, Gadha, Saarnga and Khadgam). These are also the incarnations or personifications of the Pancha Shaktis viz. Srishti, Sthiti, Samhaara, Nigraha, and Anugraha. These are an integral part of Bhagavan’s Sareeram (body) which is of Suddha-sattva made of these five Maha Shaktis, and are like His instruments in His five functions of Creation, Protection, Destruction, Punishment, and Blessing. Intellect (buddhi) abides in Madhava in the form of the mace (Gadha). This Nama refers to His form where He holds the manas tattva and the buddhi tattva in His two hands in the forms of Chakra and Gadha respectively. 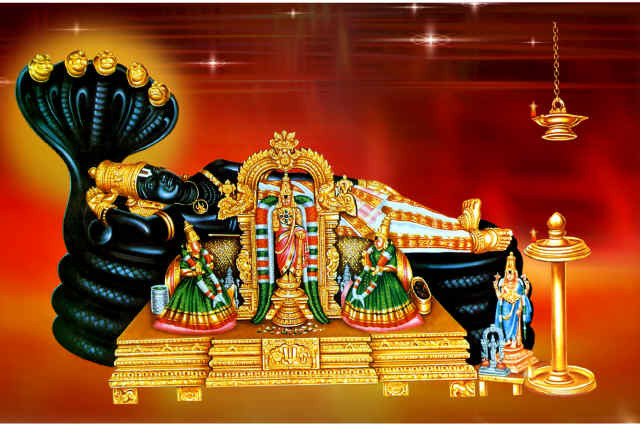 The broader meaning of the whole passage in Sri Vishnu Puranam is that Bhagavan is the source and repository of everything there is – soul, nature, mind, intellect, egotism, the elements, the senses, ignorance, and wisdom. All that is wisdom, all that is ignorance, all that is, all that is not and all that is everlasting, is centered in Him. He is time, He is the earth, He is the sky, He is heaven, etc. Thus the Nama also signifies that Bhagavan is the source and controller of everything there is, was and will be. Bhagavan incarnated as MahaVaraahah, the great boar, and rescued the Earth. He is known through words or utterances even though He is not fully describable through words. 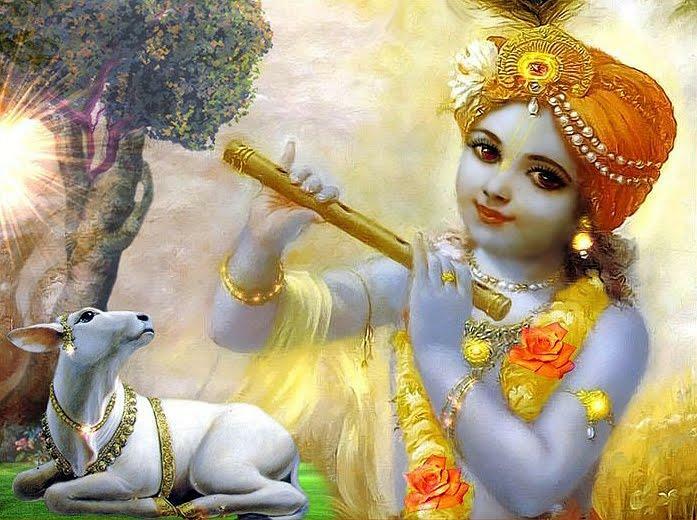 He is fully revealed by scriptures like Upanishads and hence He is Govindah. He has a distinguished army at His command supported by Ganas with Vishvaksena acting as His army chief, hence He is Sushenah. He is adorned with golden armlets and other ornaments radiating His brilliance and so He is Kanakangadee. He is hidden inside our heart and can be realised only through knowledge and contemplation, hence He is Guhyah. Bhagavan is deep and is not easily understandable; He is unfathomable and His majestic persona can only be approximately indicated, hence He is Gabheerah. It is very difficult to reach Him or gain access to Him and He is Impenetrable. He is the witness in all three states, namely Wakeful, Sleep and Dream State and hence He is called Gahanah. He is deep, incomprehensible who cannot be gauged with words or mind and is hidden, hence He is Guptah. He carries the Discus and the Mace for the protection of the world and hence He is Chakra-Gadha-dharah.